Since using Big Stitch Quilting on my "Spinning J" quilt I've been thinking about big stitch quilting a lot. It's a fun change from using a walking foot or doing free motion quilting. And it's portable, especially if the quilt isn't too big. I've looked at supplies on-line but here's what I've been able to find locally. From Joann's DMC® 5 perle cotton in a variety of great colors and DMC® 8 perle cotton just in white. I asked one of my local quilt shops if they had perle cotton. They didn't, but suggested 12 wt Sulky ® cotton thread. Here's a photo of 4 threads--top to bottom: 5 Perle DMC® cotton, 8 Perle DMC® cotton, 12 wt Sulky ® cotton and traditional cotton hand quilting thread. 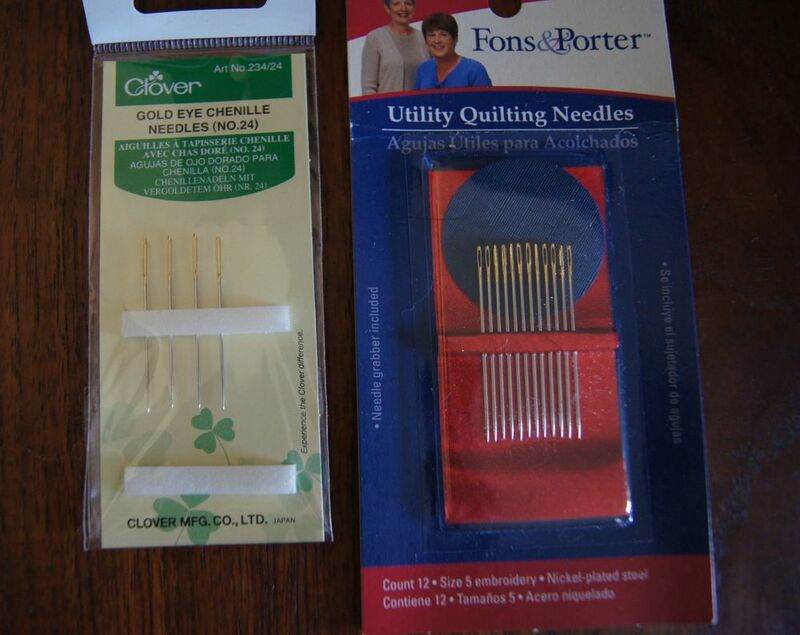 I found both the Clover Chenille needles and the Fons & Porter ™ Utility Needles at Joann's. I used the 5 Perle cotton and a Clover Chenille needle for the quilting on my "Spinning J quilt". It had a wool batting and I had no trouble doing the quilting with the thick thread. But I thought it was going to be a struggle to use a thread that thick on a quilt with cotton batting. So on my Thousand Pyramids Quilt, I'm using white DMC® 8 Perle cotton and a variety of #12 wt Sulky (R) colored cotton thread. I used a Fons and Porter™ Utility Quilting needle with both threads. 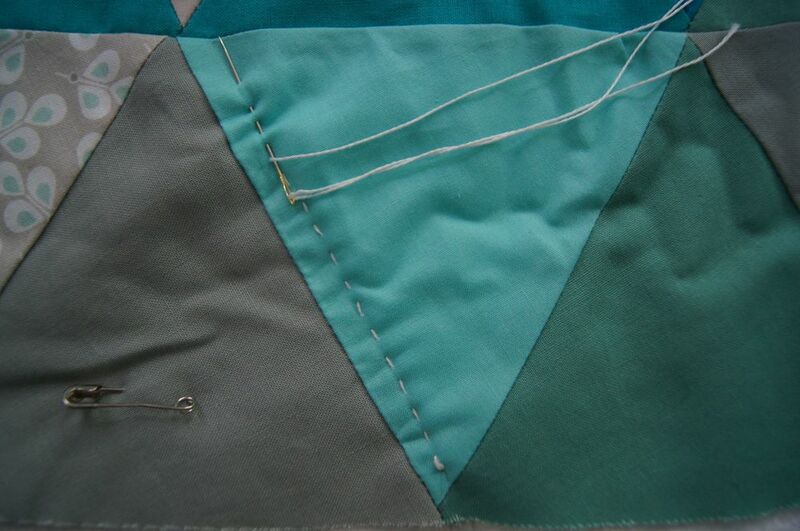 The hand quilting is easy with both threads. I was able to get 4 running stitches with the Sulky® thread though only 3 running stitches with the 8 Perle cotton. I learned traditional hand quilting from my college roommate's grandmother in their farm house in South Dakota. You can't get a better teacher than that! So I can do small even quilting stitches. But I like the organic feel of this big stitch hand quilting. It isn't perfect, but I like it like that! Give it a try if you've never done any hand quilting. It's fast, fun and it adds another dimension to your quilt.